THE CHAIRMAN of the Electoral Commission (EC), Dr. Kwadwo Afari-Gyan has stated that in as much as the commission admits that there were irregularities in the 2004 general elections, no individual or political organization should find petty excuses against the success and the credibility of the process. According to him, every human institution is bound to have shortcomings and the EC is no exception, so those election irregularities seen during the 2004 December polls were expected to come. He continued that irregularities in election do not mean anything but become issues only when they are found to have favoured one particular party. "Many people do not understand election irregularities, which come in diversities and thousand (1000) times. The most important thing for consideration is what the irregularities were, the pattern and whether they have favoured one party," he indicated. 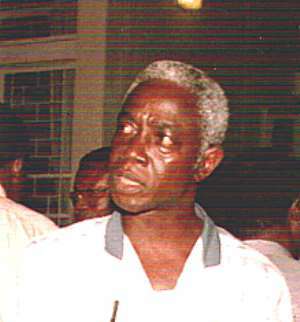 Speaking at a post election 2004 review meeting in Kumasi, Dr. Afari-Gyan however, admitted that the various concerns raised so far on irregularities could not be swept under the carpet and for that matter the Commission would consider them for the purpose of future elections. The meeting was an Electoral Commission, United States Agency for International Development (USAID) and KAB Governance Consult collaboration. He observed that the post-election review was important to the commission since it serves as the beginning of preparation by the EC to organize the next elections of this country. Touching on the invalid votes recorded throughout the elections, the EC Chairman indicated that it was and still is, the collective responsibility of all the stakeholders to educate the electorate on how to vote and not the EC alone. According to Dr. Afari-Gyan, the invalid votes were only up to 2%, adding that even 4% was accepted internationally in any election. At a point, he said he had information that a particular political party advised some of its supporters to spoil the ballots and said that this could have also contributed to the greater turnout of invalid votes cast. He thanked members of the commission for their selfless dedication and commitment to the success of the elections. The Methodist Bishop of Kumasi, Rt. Rev. N.B. Abubekar who was the Chairman of the occasion commended Ghanaians for the triumph the elections chalked, saying, "Ghana is progressing in electoral process." According to him, the review would help the Commission make headway and identify the challenges for future electoral processes. He charged political parties to take keen interest in the electoral process at all times and also ensure the education and training of their supporters.